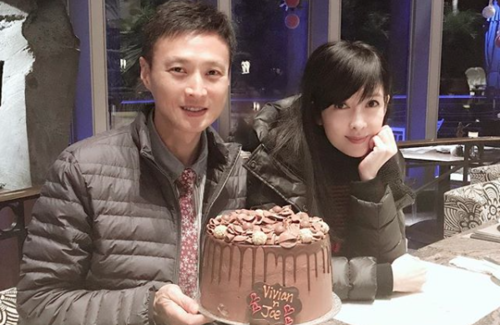 On January 5, Vivian Chow (周慧敏) and Joe Nieh (倪震) sweetly celebrated their 10-year wedding anniversary with a chocolate cake in a simple manner. In the blink of an eye, the couple has been together for 30 years, with a portion of it laced with cheating scandals and negative press. Despite the number of times they split up, Vivian’s heart was already his – in the end choosing to be with him for the rest of her life. In 1989, the couple loved passionately. Joe was known for using harsh tactics to ward off other men around Vivian. The most famous case was when he used his best-selling magazine Yes! to trash Vivian’s possible pursuer, Canti Lau (劉錫明), continuously for three years. Eventually ruining Canti’s career, it forced him to move to Taiwan. However, Joe also had a lot of women around him. The media exposed his disloyalty a few times, including his wooing of Yammie Lam (藍潔瑛) and Monica Chan (陳法蓉) among others. Still, Vivian forgave him repeatedly. What was even more surprising was their sudden low-key marriage at home. People questioned what Joe possessed that made Vivian so forgiving of him. She once said Joe is extremely rebellious and often pranks her, and she likes lively people. “When I was with Joe, we went through a lot of highs and lows together, we already achieved the art of getting along,” Vivian once said in a statement. He looks skinny almomst looks like a drug addict. trash Vivian’s possible pursue for 3 years??? What??? @wm2017 Yea…it was big news back then…and Canti wasn’t even Vivian’s pursuer technically….he had simply said in an interview that he admired Vivian (whom he had collaborated with a few times). Joe got super jealous and relentlessly bashed Canti, calling him a “poisonous tumor” (a nickname that has stuck with Canti even now) and used his power in the media circle to destroy Canti’s career. Joe is a loser who pretty much became famous because of his father (and later because of Vivian)…and Vivian lost all respect from me years ago when she continued to stick by Joe even though he cheated on her many times. that is not a look of happiness or a woman in love! at least pretend for photos , Vivian! Women make their own choices in life, and as they say – you make you own bed, you lie in it. Such is Destiny/Fate – she always stuck by Joe Nie, even taking care of his parents. When at her peak – youth in Army all had her as their pin-up idol … and anyone from Uncles = Boys would line up for her. Don’t know what she sees in him..but as long as she is happy. …I will never understand this woman; not even how she can be happy with him. He’s proven to be a serial cheater. He’s like a version of Tiger Wood, who has a beautiful and blissful wife, yet they’re not sated. At least TW wife woke up, or had to wake up with all that noises. VC seems to prefer being a sleeping beauty. I wouldnt take it once never mind 2, 3 or however many other times. He is definitely not worth it. Why is she still staying or thinks it’s alright for him to be a petty and jealous cheater. Some wrong with some women they can forgive anything just because they don’t want to leave. I wonder what Joe nationality his Chinese character doesn’t sound like he’s from Hong Kong? No wonder Canti been disappears for a very long time because of this jealousy man here like everyone said don’t know what Vivian sees in him maybe he’s got money? I always thought Leon Lai ended up with Vivian or even Aaron Kwok? I do missed Canti he’s a good singer and good actor too I remember him from the tvb drama the drifters? I think that’s the name he’s good for his role as bad guy and I think Frankie Lam, Gigi Lai and Fiona Leung in that drama too. @cutie777 I think he is Chinese. He probably has one of those last name that is just not very common. Some might spelled it as NIE only w/o the H. Not sure if bc he’s originating from HK and he added the H.